neXt PRIZE: Anyone want a SpaceShipOne for a holiday gift? 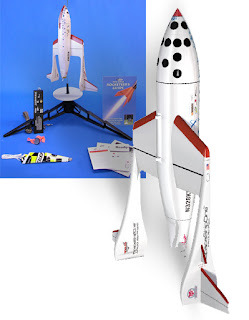 A replica rocket of SpaceShipOne was listed by Dvice as #2 on a list of toys that both adults and kids would love. Model rockets are always fun, and launching SpaceShipOne up to 400ft seems like it would be a lot of fun. I think it would be more fun if there was a miniature Brian Binnie action figure that you could pop inside to go along for the ride.